One of the most respected and humble film families has to be that of the Deols. It’s a treat to see the bond shared by Dharmendra with his sons Sunny and Bobby Deol. On-screen, it was first translated in APNE . But it was in the comic caper YAMLA PAGLA DEEWANA  where it worked big time. However, the sequel, YAMLA PAGLA DEEWANA 2  failed to strike a chord with the audiences. Now the affable Deols are back with YAMLA PAGLA DEEWANA PHIR SE. So does it entertain audiences like they did with the first part of the series? Or does it fail just like the second part? Let’s analyse. YAMLA PAGLA DEEWANA PHIR SE is the story of one man’s fight against a corrupt pharmaceutical company. Puran (Sunny Deol) is an Ayurveda expert who runs his clinic in Amritsar. He uses ancient medicinal knowledge passed on to him by his forefathers. Marfatia (Mohan Kapur), owner of Marfatia Pharma, tempts Puran’s younger brother, the good for nothing Kala (Bobby Deol), that he’ll offer Rs. 1 crore if he can convince Puran to part with the ‘vajrakawacha’ that can cure a host of diseases. Puran refuses the offer and even physically assaults Marfatia. Marfatia decides to take revenge for this humiliation. Meanwhile, Chikoo (Kriti Kharbanda), a surgeon from Surat, comes to Amritsar to study Ayurveda under Puran. Kala falls in love with her. Meanwhile, Marfatia slaps copyright case on Puran, alleging that he has the patent for ‘vajrakawacha’ and that Puran can’t use it in his clinic. Puran realizes that Marfatia has stolen the formula from him. Enter Jaywant Parmar (Dharmendra), Puran’s paying guest who has overstayed by years and pays a paltry Rs. 115 as monthly rent. Puran and Parmar don’t see eye-to-eye but when Puran gets into this legal tangle, Parmar, who’s an excellent lawyer, decides to help. What happens next forms the rest of the story. Dheeraj Rattan’s story is very poor and dated. A plot like this would have worked in the 90s or even in the past decade but not anymore. Dheeraj Rattan’s screenplay is the biggest culprit. A wafer-thin plot can be turned into a great film if the script is cracked properly. But sadly, he makes a mess. A few sequences are well thought of at the story level but at the script level, it goes kaput. For instance, Parmar’s dilly-dallying in the court in the finale could have made for a hilarious sequence. Same goes for Kala’s drunken rants at night, a la ‘Mausiji’ sequence of Dharmendra in SHOLAY . Alas, these scenes are badly written and hence, make no impact whatsoever. Bunty Rathore and Vankush Arora’s dialogues are also not worthy enough. Only a few one-liners leave a mark. Navaniat Singh’s direction is very ordinary. He didn’t add anything of his own and just executed a badly written script. YAMLA PAGLA DEEWANA PHIR SE does arrest attention in the beginning when sutradhar Annu Kapoor gives an introduction about Ayurveda medicines and its importance followed by Puran’s introduction. However, things go downhill once Kala is introduced. This is supposed to be a comic caper but throughout the film, there are hardly any scenes that would induce even a mild guffaw. The entire bit on who stole the formula from Puran’s clinic is very predictable. Kala-Chikoo’s love story is nothing special. In the second half, one expects things to get better as the madness shifts to Surat. But even here, there is hardly any scene that would be enjoyed or would touch audiences. The climax is long-drawn and the manner in which Parmar tries to waste time of the court goes on and on and tests audience’s patience. Even in a poor film like this, Sunny Deol shines. He genuinely gives his best shot and he is the only one who strikes a chord with the audiences. His scene at the airport, for instance, is touching, though again the impact is marred by poor writing. In the climax, he gets a raw deal. His action scene should have got more footage than the dragging courtroom sequence. Bobby Deol is strictly okay and goes overboard in many scenes. Dharmendra shockingly has a late entry and has very little to do in the first half. It’s praiseworthy that he’s acting even at this age. He too tries his best but is letdown by the script. Kriti Kharbanda looks beautiful and gives a first-rate performance. She constantly tries to rise above the script and make the scene better. Shatrughan Sinha (Judge Sunil Sinha) is a well thought character and could have taken the film to another level had the writing being superlative. He looks quite old but entertains nevertheless. Mohan Kapur is alright as the villain while Rajesh Sharma (Lawyer Bhatia) leaves a mark in the courtoom scenes. Asrani (Nanu) is disappointing. Satish Kaushik (Bedi) is wasted. In fact, he is forced in the narrative in the climax. His presence makes no sense at all at this point. Paresh Ganatra (Real estate broker Paresh Patel) is fine and same goes for Binnu Dhillon (Billa). Bharat Bhatia (Sainath; Gujarati neighbour who’s always suspicious) plays his part well. Others are okay. Salman Khan has a cameo in the finale and he looks disinterested. Music is also disappointing. ‘Little Little’ and ‘Nazarbattu’ have zero recall value. ‘Rafta Rafta Medley’ is shown in the end credits. Raju Singh’s background score is loud and over the top. Jitan Harmeet Singh’s cinematography is nothing special. Rita Ghosh’s production design is theatrical. Vikram Dahiya’s action is quite nice. Manish More’s editing is okay. 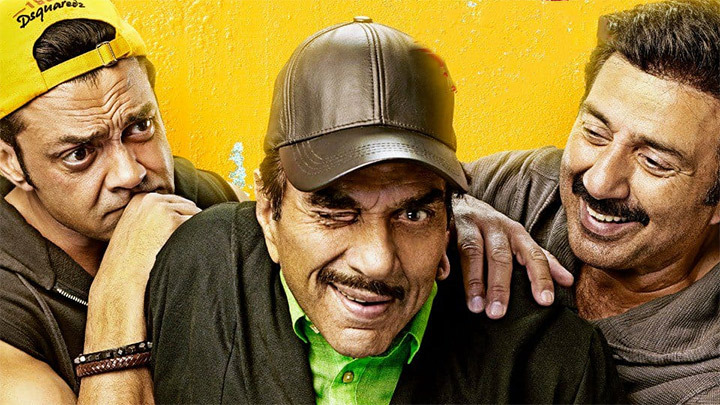 On the whole, YAMLA PAGLA DEEWANA PHIR SE is marketed as a comic caper but there are hardly any scenes that would make one laugh. Disappointing.